As many priests will tell you, these days a nice quiet chance to catch up on the breviary is a scheduled session in the confessional. Chances are they’ll have more than a few pages read before a penitent disturbs their train of thought. That’s not always the case. Take St. Joseph Parish in Downingtown, where Msgr. Frank Schmidt was helping with confessions during a penance service on Tuesday of Holy Week, April 15. Someone came to his confessional and advised him he still had about 30 people in line. “Why don’t you send them to another line?” he asked. “They all have long lines,” he was told. Now here’s the kicker. There were actually 15 priests hearing confessions that evening. Probably most lines had less than his because he was hearing in a traditional confessional rather than face to face, and there are still a fair number of people who would prefer not to look the priest in the eye as they are reciting their personal litany of sins. But there were still a lot of people. “Somewhere between 400 and 500,” estimated Msgr. Joseph McLoone, pastor of St. Joseph’s. And no, this was not a penance service for the regional PPA (Parish Planning Area), the Western Chester County Deanery or the whole county. This was for the most part parishioners of St. Joseph’s getting themselves straight with the Lord prior to Easter. Knowing it would be a full house Msgr. McLoone had lined up a number of priest friends to hear the confessions. St. Joseph’s is unusual in that at 162 years, it is one of the oldest parishes in Chester County but in an area that in recent years has shown tremendous Catholic growth and vitality. 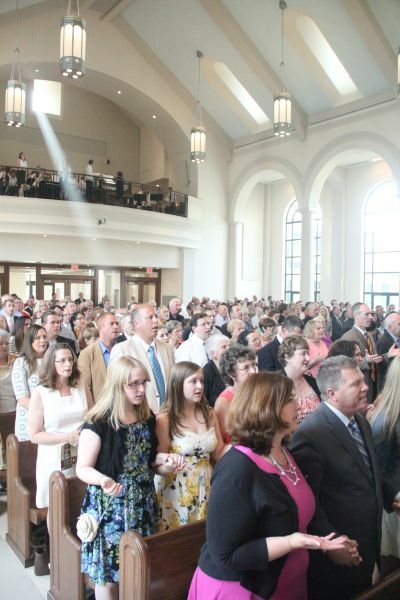 With about 15,000 parishioners, “We are like Northeast Philadelphia in the 1950s,” Msgr. McLoone said. Msgr. Schmidt himself has been hearing confessions for 57 years as a priest. Have they changed over the years? 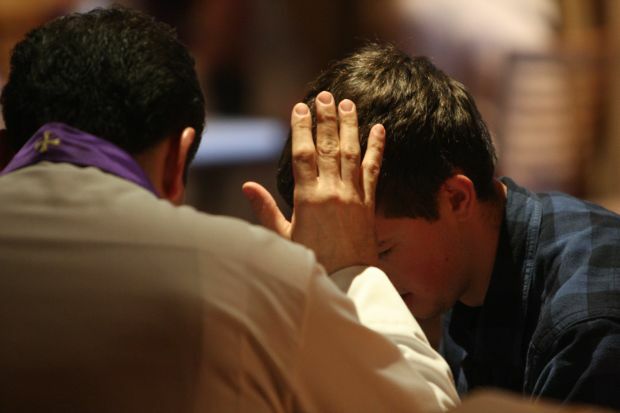 One thing he notices is that parishes often have family opportunity for confession — perhaps at first confession or pre-confirmation confessions inviting other family members to participate in the sacrament also, sometimes with separate lines for the adults. Sin, of course, has always been with us, but maybe in the culture and media of today children are exposed to corrosive influences at a younger age. Therein lies the paradox. In this time when there is the greatest need for the healing graces of the sacrament, penance has fallen out of fashion. We can only pray that the long lines of penitents of all ages at St. Joseph’s can be replicated everywhere.